China will soon surpass the US in economic terms – and is taking the lead on climate change and the digital economy. At least three competing versions of the future world order crashed together at the World Economic Forum's gathering in Davos last week. There was the one peddled by a combative Donald Trump, calling for a full-scale US retreat from the current order. Another came from Chinese leaders who proposed a new global economic system built around Beijing. Meanwhile, Canada's Justin Trudeau and France’s Emmanuel Macron urged western leaders to double down on the current liberal order. It would be a mistake to dismiss their speeches as empty grandstanding. This debate is deadly serious. The outcomes will likely determine the future of global stability and the security and prosperity of everyone. If the leaders of major countries and international organizations cannot see eye to eye, we are in for a very rough ride. Rather than withdraw, what is needed more than ever are new ideas, institutions and blueprints to navigate the coming storm. We are living in abnormal times. The global liberal order is in an advanced state of meltdown. And as the world rapidly shifts from a uni-polar to a multi-polar reality, the international system itself is exposed to profound instability. If the situation is not handled with extreme care, the potential for a major collapse is real. The question is whether our world leaders are capable of fully understanding what is happening in real time and can muster the collective action to set new rules of the road. The old global liberal order served as the bedrock of peace and stability since 1945. It was purposefully designed by the US and its western allies to prevent armed conflict and the economic nationalism that gave rise to it. It is composed of the United Nations, the International Monetary Fund and World Bank, the World Trade Organization, the North Atlantic Treaty Organization, the G20 and a thicket of treaties and agreements. While experiencing its ups and downs, it set the rules for a stable positive-sum game. While virtually everyone agrees that a rules-based system is essential to managing security and trade, a power struggle is underway over who writes and enforces them. The spectacular rise of China over the past two decades and the relative decline of the US mean that sparks are bound to fly. Yet most westerners are only dimly aware of what’s occurring since the rug was so quickly pulled out from under them. The potential for catastrophic miscalculations – including US trade actions against China – are rising, with potentially devastating cascading effects to the global economy. To get to grips with the seismic shifts taking place, consider these five facts. 1) China is in the process of surpassing the US economically. 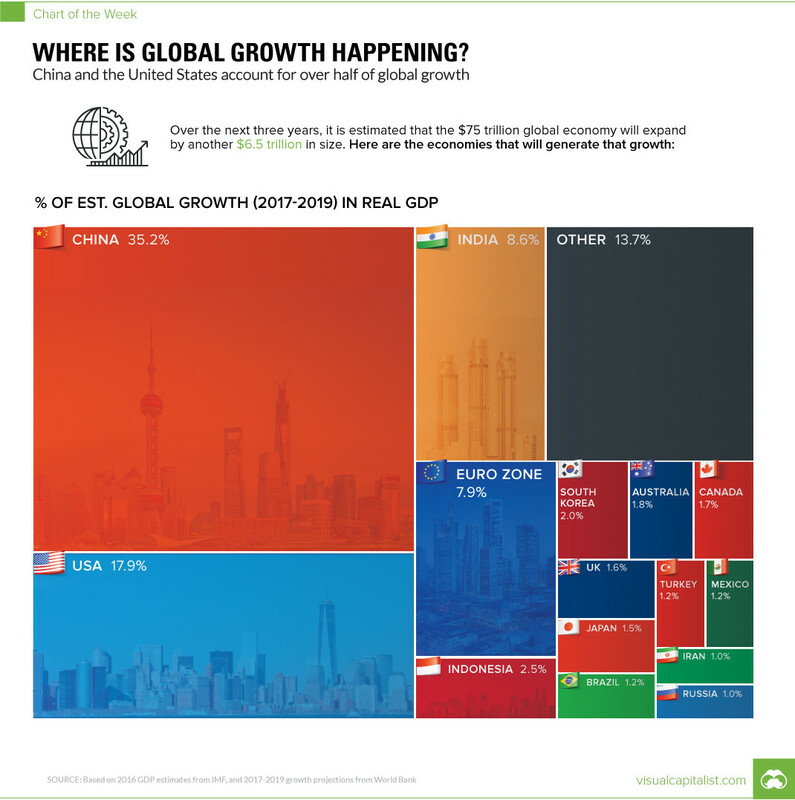 By one measure, 35% of world growth from 2017 to 2019 will come from China, 18% from the US, 9% from India, and 8% from Europe. By 2050, the top five largest global economies are most likely to be China, India, the US, Brazil and Indonesia. Is the west even remotely prepared for this kind of world? 2) China is leading the largest urbanization and infrastructure development scheme on earth. Already in its fifth year, the $900 billion "One Belt and One Road" (OBOR) project includes new roads, shipping lanes and building projects stretching to over 65 countries. The idea is to literally rewire global trade from China throughout Asia, the Middle East, Africa and Europe. While details are hazy, OBOR is being financed by Chinese state banks, with a modest strategic contribution by a new Chinese-backed Asian Infrastructure Investment Bank in partnership with other institutions. 3) China is set to become a global green powerhouse. China signalled its intention to take the lead on climate change reduction after signing the 2015 Paris climate agreement. By 2025, most new cars in China will be fully electric vehicles. China is aggressively cutting coal usage. Already, over 60% of high speed rail in the world is in China (10 times the length in Japan, for example). China also recently committed to achieving blue skies in all of its major cities within three years. The changes are already being felt: Beijing air is 30% cleaner this winter than last winter. 4) China is also setting the global pace on a digital economy, including cashless payments. In major cities, up to 90% of all commercial and retail transactions in convenience stores and cafes are occurring through Alipay and Wechat. E-commerce delivery in large Chinese cities through Alibaba is the currently the fastest in the world. One company, Alibaba, racked up sales of $25 billion in just one day – dwarfing the returns of so-called Black Friday and Cyber Monday in the US. 5) Chinese universities are also vaulting to the top of the international rankings. Two schools – Peking University and Tsinghua University – leapfrogged from well below the top 200 to the top 30 within five years. There are another 40 universities that are not far behind and are set to enter the elite in the coming years. While Chinese students are still seeking out educations in top schools in North America and western Europe, soon they won't have to. All the while, the west seems to be asleep at the wheel. There is a certain irony in our current predicament. On the one hand, the world is experiencing unparalleled levels of prosperity and connectivity, due in no small part to the US-backed global liberal order. Yet these advances are associated with ever greater complexity and systemic risks, increasing the liberal order's vulnerability to collapse. The world's global and national institutions are increasingly incapable of managing stresses to the system. Democracies, it turns out, lack the incentive systems to address higher-order and longer-term imperatives. Faced with threats ranging from climate change to massive technological advancement, the world is in desperate need of stable and able global governance. And yet there is surging opposition to liberal governance due to rising inequalities and frustration with the perceived failures of the liberal order. Francis Fukuyama and Jan-Werner Müller view populism and the rise of parochial economic nationalism as among the gravest threats to future stability. The risk of a disorderly collapse of the system is more real than ever. If we are to survive the global geopolitical transition, we must first accept that the era of US hegemony is over. Instead, the world is shifting to a new multi-polar order with the US and China at its centre. We need to restore and rebuild stable institutions and rules that acknowledge the changed context. They will need to be more inclusive, representative and legitimate. The role of international mechanisms of cooperation (such as the G20), regional organizations, non-state actors – especially financial and philanthropic actors – will also need to be elevated. What's more, cities are claiming their place – witness Urban20, a collaboration between the world's largest cities, to be formally launched in October 2018. All of this will be hard to swallow for stalwarts of the global liberal order. It will also need to be explained to a public that is accustomed to linear change. The current transformations are both non-linear and increasingly exponential, processes that are hard for humans to grasp. We are fixated to the forward march of democracies and the underlying principles on which they are based, yet we must learn to compromise and accommodate multiple value systems. The next order will be more complex and potentially more precarious, but that is the brave new world we face. This article forms part of the Phil Lind Initiative in US Studies series on the future of the liberal order. The series is led by Robert Muggah and Taylor Owen and features Edward Luce, Steven Pinker, Anne-Marie Slaughter, Francis Fukuyama, Susan Rice and Misha Glenny and is hosted by the University of British Columbia's School of Public Policy and Global Affairs.